Dunraven Castle, a building that I have written extensively about was a castellated manor house that stood on the cliffs of Southerndown, South Wales. It is now nothing more than ruins entwined by beautiful gardens. But what happened? 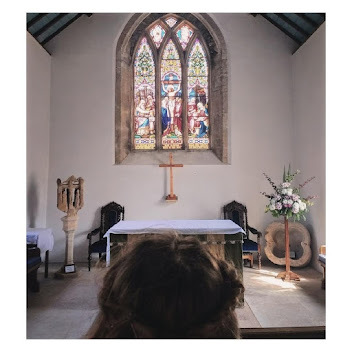 There are various stories including tales of the building being moved stone by stone to America and even that the building was dynamited – these are merely fiction and in this article I hope to delve into the past and reveal the truth! The Castle of Dunraven was built on the site of an early Iron Age Fort. It is said to have been a Royal-Roman stronghold during the time of Bran, the son of Lear. There is record of the Saxons burning the residence of Dunraven during 1050, it is also noted that Rhys ap Tewder destroyed the residence some thirty years later (1080) when it was the home of Iestyn ap Cwrgan, the last native Prince of Glamorgan. During the time of the Normans ‘Donrevyn’ fell under the Lordship of William de Londres, one of Robert FitzHamon’s Twelve Knights of Glamorgan. In about 1128 the manor and land of Dunraven was awarded to Arnold de Boteler (the Butler of the Ogmore residence of the de Londres family) after he bravely defended Ogmore Castle against the attack of the Welsh. The Boteler (Butler) family held Dunraven throughout the 12th , 13th, 14th and 15th centuries until the male line of the Boteler’s died out. During this time it (15th century) is reported that Owain Glyndwr destroyed the Castle. Ann, the daughter of Jane and John Boteler married the soon to be notorious Walter Vaughan thus bringing the estate into the Vaughan family. During the 1540’s Dunraven is described as a “Manor Place” owned by Walter Vaughan. In 1642 Sir Richard Vaughan sold the estate to Humphry Wyndham the husband of Jane Carne of Ewenny whose descendants were the Earls of Dunraven. In 1803 Mr Thomas Wyndham made alterations to the Manor House as did his grandson Edwin (the son of Countess Caroline of Dunraven) in 1858! 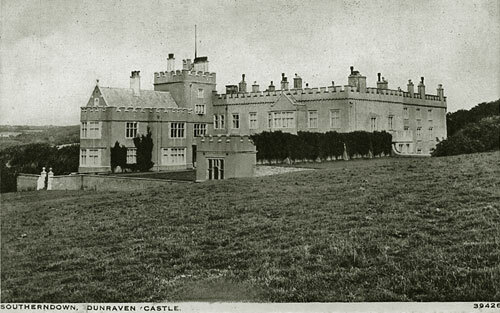 After these works the Manor House attracted the named Dunraven Castle due to its many castellations. After the Second World War the Manor House was used as a WTA Guest House. The property and grounds were rented and run by the W.T.A from the 6th Earl of Dunraven Richard Southwell Windham Robert Wyndham-Quin. The property was managed by Mr & Mrs Anderson. The building was finally dismantled and bulldozed into the tennis court/gardens. what a sad waste. Love the Ice House and extant gardens however. Still worth a trip. Are there any photos of the building still standing in the late sixties / early seventies? I have a very early almost dream-like memory of seeing the house from the car park in the bay when I was a small child and wondering at such an amazing place. Did I really see it? My grandfathers family were in service at the castle, he worked in the mines until 1926 when he was part of the march on London. He married my Grandmother in Leicestershire and named the bungalow he had built for them Dunraven. The memories could not have been too bad.